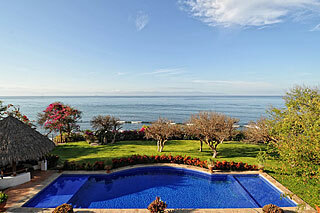 Casa Puesta del Sol is located in the state of Nayarit, Mexico just 25 minutes north of Puerto Vallarta’s Diaz Ordaz International Airport and 10 minutes south of the world-renowned Four Seasons Resort, Punta Mita. This six bedroom, five bathroom lavishly furnished and decorated home was designed by renowned Mexican architect Juan Monguia and is a true classic Mexican hacienda. The lush tropical gardens and homesite cover a full acre in the exclusive Costa Banderas gated community known as El Farallon. Casa Puesta del Sol is situated approximately 50 feet above sea level, allowing afternoon sea breezes to carry frigate birds and pelicans aloft. The elevation also affords spectacular daytime views to the east across Bahia Banderas to Cabo Corrientes as well as stunning sunset views west towards the Marriettas Islands. For those who love nightlife and fine dining, the city lights of Puerto Vallarta are a shimmering reminder that town is just a decision away. However, if a secluded, mile long, white sand beach and crystal clear water is more to your liking, that’s available as well... just walk down the stairs and enjoy. November through March is whale watching season and if you would like to observe the migrating and calving Humpback whales from a local village panga (skiff) the service is readily available. Although the panga adventure is truly an experience, it isn’t a necessity as some of the best whale watching occurs right in front of Puesta del Sol. The house comes with fulltime staff on the property, Ramon and Olga, who will attend to general housekeeping and the preparation of two meals per day. Ramon is an excellent chef/bartender and can prepare most any culinary delight. His services are for a maximum of ten people and are included in the rental fee. Of course, the cost of groceries and tip are covered by the guests. Whether your vacation plans are filled with exciting Vallarta nightlife, fine dining, sightseeing, beach activities or just plain relaxation, Casa Puesta del Sol is perfectly situated, appointed, and staffed to make your dream vacation a reality! 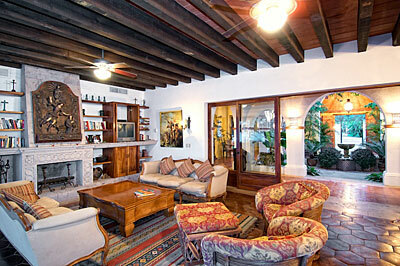 I wanted to let you know how much we enjoyed our stay at Casa Puesta del Sol. It really exceeded our expectations. The house was wonderful, with it's spacious rooms and vast outdoor space! Just perfect! Our three families were super comfortable there. And the service was just incredible! We loved Ramon, Annie and Bennie (not sure if you've met him, but he is great!). They were so kind to us and our children and really accommodated our every need. The meals were delicious and the service was just incredible! We spent a lot of time at the pool, but also really enjoyed the incredible beach. Our kids played in the sand, and the ocean, both body surfing and boogie boarding. They loved it! We went to the St. Regis one afternoon and really missed our hidden gem in El Farallon. The kids/adults all got their feet torn up by the coral, the beach was a rocky and unswimmable mess and they charged us $20 for Mojito's. No bueno! We told Ramon that we'll be back next year as we are hoping to make it an annual trip. Maybe the same weekend and/or the following weekend. Let us look at our school calendar and then we'll get back to you! Thank you again. We had a blast!